Our discovery of Nkx2.2 in the regulation of cell fate decisions in the pancreas have led us to explore other tissues where Nkx2.2 is expressed in progenitor populations: the intestine and CNS. We are using our novel mouse genetics tools to study the function of Nkx2.2 regulating enteroendocrine cell fate decisions in the intestine. Furthermore, we are defining the role of Nkx2.2 in specifying ventral neuron cell fates in the spinal cord and hindbrain. These studies are clarifying how common sets of transcriptional factors can regulate distinct molecular pathways to define cell fate decisions in diverse sets of tissues. The Gata family of zinc finger transcription factors is important in many developmental processes. We have determined that Gata4 and Gata6 have dynamic expression patterns during embryonic development and that Gata6 plays essential roles during pancreas formation and subsequent endocrine cell development. We are currently studying conditional (floxed) alleles of Gata4 and Gata6 to determine their precise functions during islet development. 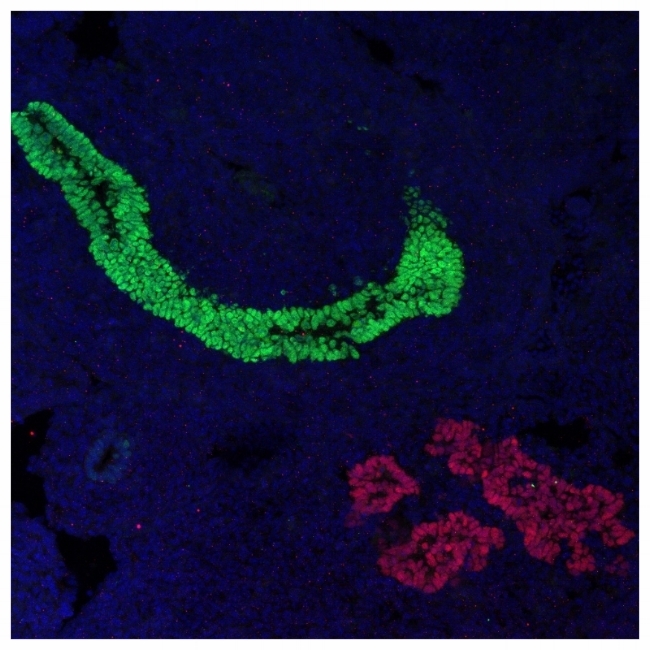 These studies have led to the important discovery that Gata4 and Gata6 are not required for the initial specification of the pancreas domain within the developing foregut endoderm, but function redundantly to control the outgrowth and differentiation of the pancreas. Simultaneous disruption of both Gata4 and Gata6 lead to pancreatic agenesis by birth. Genetic and molecular studies are ongoing to determine the common and distinct pathways regulated by the Gata factors in the pancreas, liver and heart. During pancreas development, the specification of individual islet cell fates from a common Neurogenin3+ endocrine progenitor cell is an essential step in the generation of insulin-producing beta cells. We have determined that Nkx2.2, an essential homeodomain containing transcription factor plays a key role in islet cell fate decisions. Null mutations in Nkx2.2 result in the production of excess ghrelin cells at the expense of all beta cells and the majority of alpha and PP cells. Understanding how these important cell fate decisions are regulated will be crucial for the successful generation of functional beta cells from alternative sources, including stem cell populations. We have used Recombination Mediated Cassette Exchange (RMCE) technology to generate mutant alleles of Nkx2.2 and we have generated a conditional allele of Nkx2.2. These novel tools will allow us to determine the precise temporal and spatial functions of Nkx2.2 during pancreas development. These studies have already implicated DNA methylation as a major factor in the specification and maintenance of islet cell fates in the embryo and in the adult. We are also exploring the complex transcriptional regulatory networks that function upstream, downstream and in parallel with Nkx2.2 to specify and maintain each islet cell fate. A very poorly understood process in the in vitro and in vivo generation of beta cells is the transition to a fully glucose-responsive functionally mature cell. In the mouse, the maturation step is executed in the first few weeks of life, likely in response to environmental signals. We have determined that NeuroD1 is an important regulator of the beta cell maturation process. We are using mouse genetics, molecular biology and high-throughput sequencing analysis to explore the upstream and downstream regulatory events necessary for the initiation and maintenance of fully functional beta cells in vitro and in vivo. Although we have identified many of the transcriptional regulators that are necessary for islet cell development and function, there are many aspects of the regulatory process that remain a mystery and/or cannot be resolved with our current molecular tools. We have embarked on the analysis of long non-coding (lnc) RNAs that might function in the known transcription factor network pathways. These studies have identified several lncRNAs that are regulated by Neurogenin3 and/or Nkx2.2 and potentially regulate the development, differentiation or function of beta cells. In addition, we have identified an important role for DNA methylation in mediating the transcriptional events that regulate islet cell identity. These studies will clarify the complex inter-relationships between DNA modifications, coding genes and non-coding genes to regulate important developmental decisions and cell lineage choices.